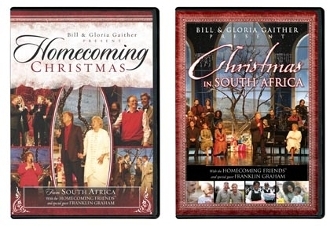 You will be blessed as Anthony plays several songs in one of his last appearances.These captivating Homecoming videos take you into the heart of South Africa with a wonderful group of artists including Bill and Gloria Gaither, Anthony Burger and the Gaither Vocal Band! Featuring an exciting evening of singing and sharing with the Homecoming Friends, you'll rejoice in the Spirit of Christmas and the joy of giving. Song list includes :Deck The Halls / Jingle Bells / Feliz Navidad, Reaching, Hallelujah Chorus, Beautiful Star of Bethlehem, Away In A Manger, Changed By A Baby Boy, Jesus What A Lovely Name, The Glorious Impossible, Joy to the World and many more!